I am trying to convert .abr files to something I can use in gimp. Please help me. (07-01-2018, 12:04 PM)glencher@mailbox.org Wrote: I am trying to convert .abr files to something I can use in gimp. Please help me. Many .abr files can be used directly in Gimp (depends on the version of photoshop that created the .abr). Put the .abr in the brushes folder of your user profile. Refresh brushes or restart gimp. 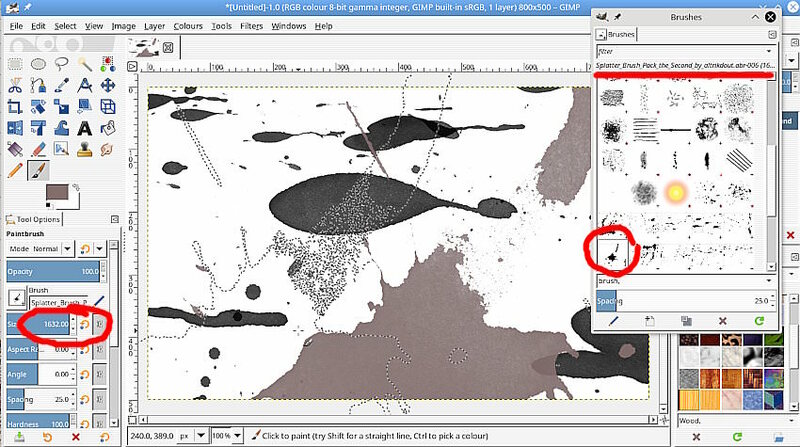 A PS .abr brush generally works out-of-the-box in Gimp. There might/will be exceptions where brushes for more recent version of PS is concerned. Every new version of PS, adds more (unsupported) features. If it does not show in the brushes dialogue, then most likely it is too modern. Post a link to the file and let us have a try with it. If you already have something like that working and you just want a single brush from the something.abr file. Right click on the brush in the brush dialogue. Second options is Open Brush As Image Open it. Export as a Gimp .gbr brush. If you have access to Windows, then the program abrmate can open abr files and export them as earlier versions of abr. If nothing else, abrmate can export the brush tips as png files, I believe. This only issue is that you need access to Windows.